Meet your labelling needs with these versatile and compact desktop label printers. 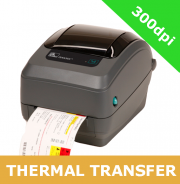 Space saving, feature-rich and user friendly, these thermal label printers are a smart choice. 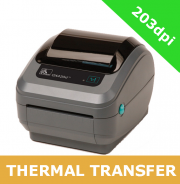 The Zebra GX420 desktop label printer and Zebra GX430t thermal transfer desktop label printer fit almost any low to medium volume printing application and budget. 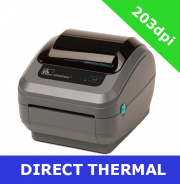 The GX420 series is available in two version - the Zebra GX420d is direct thermal whilst the Zebra GX420t is thermal transfer. The Zebra GX420d and GX420t printers are available in 203dpi, the Zebra GX430t printer is available in 300dpi. Both the GX420d/GX420t and GX430t printers offer serial, parallel and USB interfaces as standard. ZebraNet 10/100 PrintServer is an option. They have a maximum print width of 104mm.